Christian Thompson, Director of Information Services at CITIC Pacific Mining discussed their experiences with growth and to go cloud or not. Jeff Word, Vice President of Product Strategy at SAP shared the latest SAP Technology strategy. John Kelvie, IS Director at Fonterra outlined how their company replaced legacy systems with SAP for a future SAP road map. Bridgette Chambers, CEO of the America’s SAP User Group (ASUG) introduced the concept of Infinite ROI. Malcolm Humphries, BI Solutions Architect at Fonterra; and Keith Murray, Global Product Manager for SAP In-memory computing at IBM shared real-world experiences of how BWA can be deployed and the realities of the SAP’s new HANA in-memory product. In addition, breakout sessions focused on industries, solutions, business/analytics, and IT organization/Technology, and BOBJ. The mobile sessions, BI sessions, solution manager, and upgrade sessions received a lot of attention. Of note, Australian SAP Mentors Paul Hawking, John Moy, Graham Robinson, and Tony de Thomasi were in attendance providing their wisdom and insights throughout the event. Traditionally an SAP only and SAP centric market, conversations with attendees confirmed a significant shift in approach. Cloud computing, mobile enablement, business pressures, and the need to align with business strategy have driven many Australian SAP customers to stray away from a single vendor approach. For instance, on the mobile side, SkyTech’s offerings show good penetration. For collaboration solutions SharePoint and Yammer appear to have gained mind share. CRM remains dominated by Salesforce.com and Microsoft CRM. Analytics discussions include Business Objects but IBM Cognos, Oracle Hyperion, QlikTech, and other cloud based solutions show significant presence in conversations. With 65% of the respondents considering solutions outside the SAP sphere, SAP HQ should take note that the Fortress SAP approach no longer holds true in ANZ. The good news – 60% of respondents have made the decision to upgrade to the latest SAP products and remain interested in having SAP as part of their long term strategy. SAP remains in good relationships with its key customers. 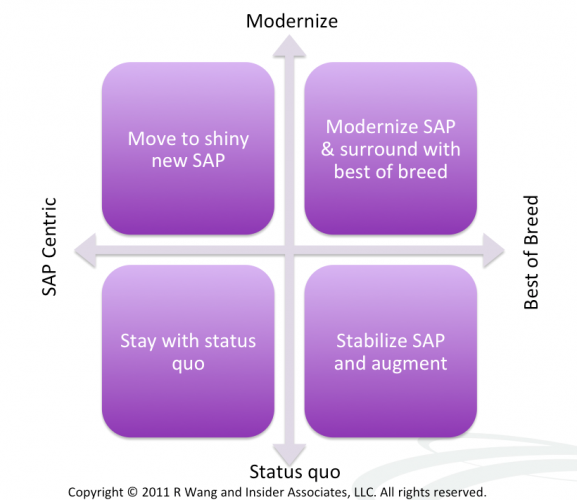 While customers do see SAP as a core part of their strategy, it is not the only strategy. Meanwhile, at a CIO Council (SCC) Forum session on the Four Personas Of The Next Generation CIO, most CIOs indicated that their IT budgets had been reduced between 1 to 5% in 2011 versus 2010. However, many indicated that Consumerization of IT has emerged as a significant trend with business leaders procuring significant technologies through the cloud and devices such as tablets. In fact, Constellation estimates an average of 22% increase in tech spending despite reductions in IT budgets. Who’s buying? The business. ANZ SAP customers have focused their investments on optimization over the past three years. With the GFC coming to a close and pent up demand by business, there appears to be a surge in tech investment. Why? Organizations prefer to invest in technology instead of new hires. This trend is opening up interest in the five consumerization of IT categories of social, mobile, cloud, analytics, and unified communications. However, the lack of a cloud offering such as ByD or Large Enterprise Line of Business Solutions by SAP in the ANZ market until Q4 means competitors such as Workday, Taleo, SuccessFactors, Salesforce.com, QlikTech, NetSuite, and Microsoft can continue to provide SAP customers with alternatives for edge apps and solutions. Even on the mobility front, solutions such as SkyTech deliver solutions in a faster, better, cheaper mode. For ANZ SAP customers, SAP must quickly provide the solutions customers seek and not wait it out. SAP’s showing good momentum in this direction, but keep in mind, the IT leaders no longer call all the shots. In fact, patience among business users wears thin and many of them now control the tech spending budget. As an SAP user or an enterprise apps user are you feeling the same business challenges? What have you done to address consumerization of IT? Add your comments to the blog or reach me via email: R (at) ConstellationRG (dot) com or R (at) SoftwareInsider (dot) com.